MildlyHotPeppers, previously MildlyHotCreations, originally MildlyHotVideo, was created in September 2007 by Chris and Josh. The first official comic was posted September 18, 2007. Most of the artwork (flash and comics) is done by Chris; many of the ideas have been contributed by Josh. On January 5, 2008, Anthony joined the site as a comic artist. Dan joined the gang September 3, 2008. 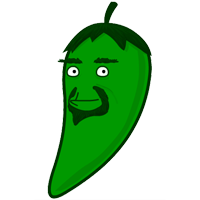 As of January 5, 2008, MildlyHotPeppers was updated daily. Beginning August 5, 2008, however, Chris decided to update on Mondays, Wednesdays, and Thursdays while Anthony takes over on the weekends. As of September 3, Chris updates Mondays, Wednesdays, and Fridays while Dan updates Tuesdays and Thursdays and Anthony updates on the weekends. Talk about variety, eh? You can contact Josh at josh(at)mildlyhotpeppers(dot)com. You can contact Chris at chris(at)mildlyhotpeppers(dot)com.